The wonderful world of technology has leaped us into ideas and realities beyond our expectations and smartphone designers don’t fall short in their efforts. We all know that we can call our friends, check our email, update our social status, etc. with our Smartphones, but the possibilities of the functions our smartphones can provide are endless. 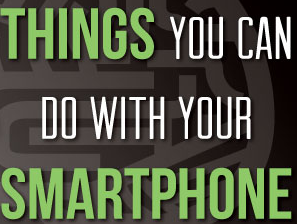 Take a look at this fun Infographic that depicts the top ten things that we can do with our smartphones, things that truly prove that our phones have smarts! Following Infographic will tell you and teach you Top 10 Best Productive Things to Do with Smartphones/Tablets to improve productivity at work and home.